In 2012 Plantlife published a report Our Vanishing Flora highlighting the desperately sad statistic that in 75 years 97% of our meadows have been lost. 97% which means a miniscule 3% were left. Prince Charles the patron of Plantlife galvanised into action and to celebrate the Queens coronation set about organising the Coronation Meadows project, 60 meadows for 60 years of the Queens reign were identified across the UK at least one for each county. 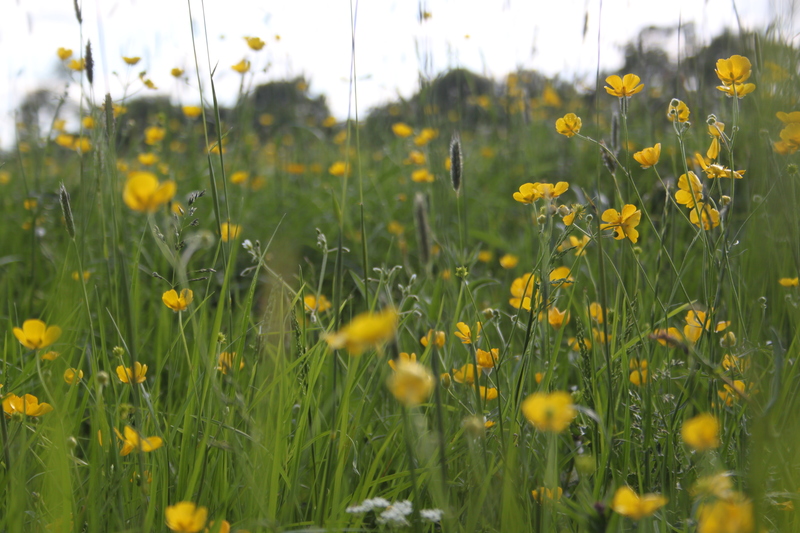 With a threefold task, firstly to celebrate our rare surviving meadows, secondly to create new meadows with seed gathered from designated Coronation meadows and thirdly to encourage the public to discover and nominate new meadows known as Peoples Meadows. Fancott meadow, an ancient meadow in Bedfordshire is reached by a public footpath tucked away behind a pub. Archie, always ready for a good walk came too. A few Hebridean sheep now graze the meadows, so Archie was soon back on a lead. 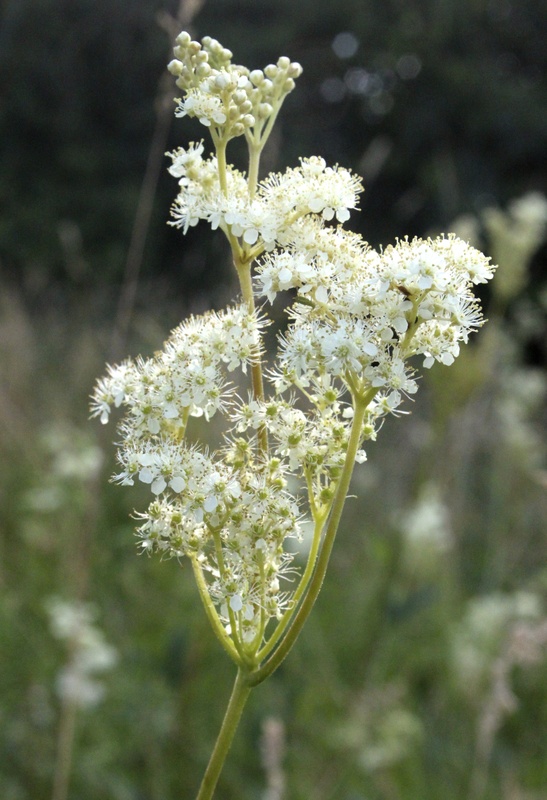 We had previously visited last July when there were lots of Meadowsweet Filipendula ulmaria in full flower thriving in the damper areas but just beginning to form buds in late May. It was too early for Ragged Robin and Great Burnet – Sanguisorba officinalis and we had missed the Cowslips and Adders tongue fern, but lots of Clovers, Vetch, Birds Foot Trefoils and early Meadowsweet amongst the Buttercups and we easily spotted Yellow Rattle which is a semi parasitic grassland annual, this little gem weakens tough grass growth, helping other wildflowers to thrive. I bought some seed earlier this year with a little project of my own in mind. I am joining in with Gail at ClayandLimestone who hosts the Wildflower Wednesday meme on the the last Wednesday of each month. Please take a look there are lots of other Wildflower posts to enjoy and share. I would love to have a meadow, and I even tried, but what I wasn’t counting on were all the pernicious weeds, like dock, invasive foreign and native blackberry vines, Canadian thistle, etc. that take over when there is no mowing or active weed pulling, so I abandoned that. It’s wonderful if an ecology hasn’t been ruined by introduction of invasive species so a meadow can carry on as a balanced ecosystem. 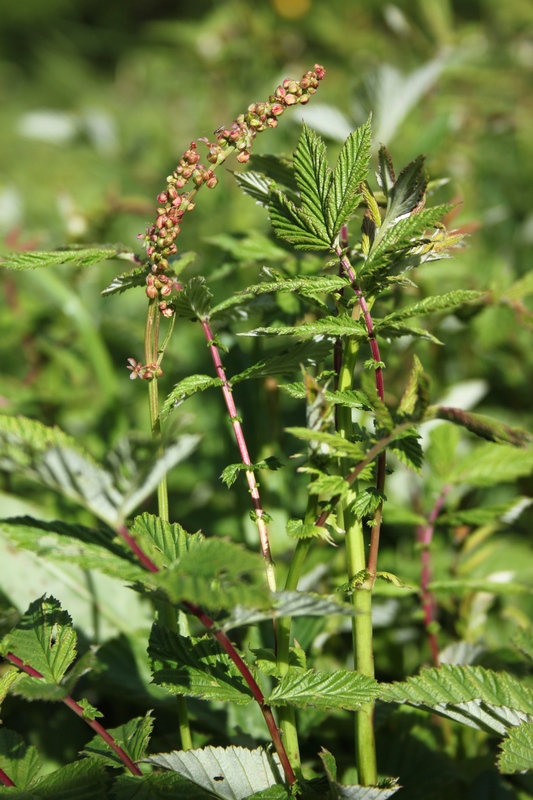 Yes, that is a tricky business, I would like to change what is a wild field of non-native Himalayan Balsam, ground elder, nettles and grass into a meadow, which is I why I started with a purchase of Yellow rattle seed, I am told I have to dig all of the above out first. I know before I start that this is not going to be easy and that maybe apart from removing the Balsam I shall have to enjoy the ecosystem presented to me. It still supports a great deal of wildlife. Beautiful flowers~I love the Yellow Rattle. Happy WW! You too Gail, Thanks for hosting this, I really appreciate the opportunity to learn of other wildflowers across the globe. 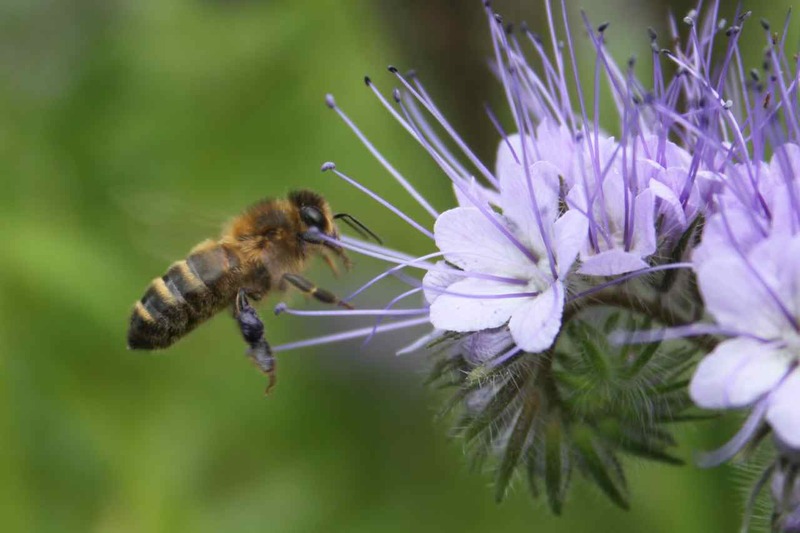 The bit of information about the declining wildflowers has surprised me so I’m glad to learn of the meadow project. The semi-parasitic Yellow Rattle with its contribution to the meadow is so interesting and quite pretty too. I also find it sad that I have to drive some way to see a meadow, in the same way I would a cultivated garden, its such a massive shame. That is such a sad fact about the meadows. One repeated, I’m sure, across most of the world. My little area is very fortunate to have so many wold flowers growing in fiels used predominately for sheep. Apparently Fancott was originally grazed by horses until 2006, when the Wildlife Trust took over its management, the horses were removed and sheep introduced as they positively help with wildflower meadows. A very lovely post Julie. I didn’t know about the Coronation Meadows and am so pleased there is a prominent royal, i.e. Prince Charles, who is interested in our environment – he has got so many projects started. Yellow Rattle is new to me – don’t think it grows near us. Prince Charles has a wonderful organic garden with his own beautiful wildflower meadows at Highgrove, I visited two years ago with my mum, no photography allowed. Its stunning. 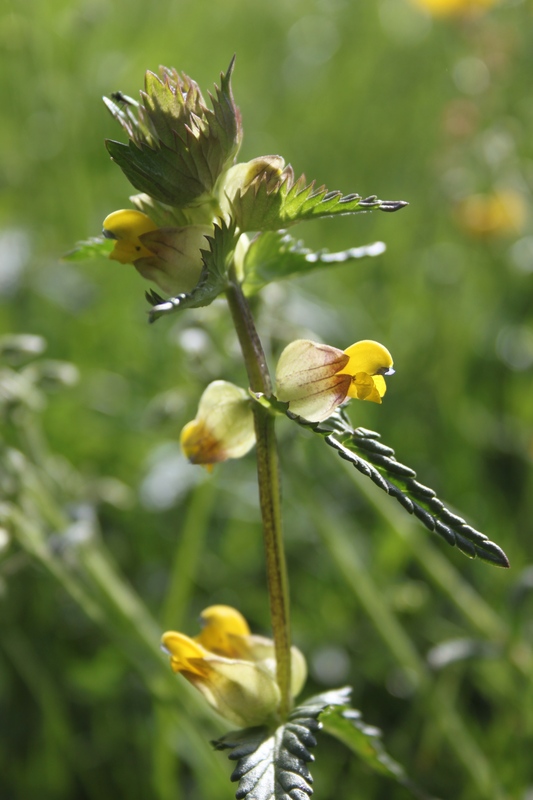 Yellow rattle used to be a menace for farmers, but apparently is now used to help with removing grass, allowing wildflowers some breathing space. I am going to experiment at home. Sad statistics and with the ever growing population we’ll probably loose much more wilderness and natural beauty. Both here in France and in Switzerland I’m surrounded by yet unspoilt woods and meadows and cherish every moment of it. That sounds a really lovely place to be, you are right, the ever growing population and the need to produce food for us all is the root cause. We have very aggressive farming methods here, that realistically will only increase. I hope that growing awareness can at least redress some of the balance. A great post, Julie. I think these Coronation meadows are a wonderful idea. The trouble is that the meadows we have lost took centuries to establish. But still it is a start. Another great development round here is that some farmers are leaving a wide strip round their fields for wildlife and replacing some of the hedges they took out. Perhaps things are beginning to change. I am intrigued to learn more about your new wildflower project. I hope they are beginning to change, sadly we haven’t noticed such forward thinking farmers here yet. There is a patch of ground behind my veg plot that was full of nettles and grass, I cleared them, only to find ground elder has marched through, whilst my back was turned! Now I am not sure how to deal with that, as I would like to make way for the few wildflowers that do grow there and introduce some more. The Yellow rattle seed will help with the grass, but not the ground elder. Good for Prince Charles! We have a similar situation here in the Midwest, with only a few acres here and there of virgin prairie left. Many places, however, are re-creating prairies, including a park near my home which I love to visit. Archie looks like he is enjoying himself! Oh thats a shame too, I am glad that you are able to at least enjoy one of the recreated prairies. I hope they go on to recreate even more. Archie is a great companion. The most effective way I have found to deal with ground elder is to dig up as much as possible and then cover the whole area for a season with black plastic, cardboard, whatever you have that will exclude light. I did this round my pond, it looked awful but it seems to have worked. Fingers crossed. Thank you, I will do this, the rain has softened the ground and will make for an easier dig this weekend. The coronation meadows are a great idea. In the US we have a problem with farmers plowing up even marginal land that used to be avaiilable for wildflowers and open space. Money and productivity. There are campaigns here, which are slowly making a small difference on our roadside verges and some minor progress with marginal farmed land. But not enough. 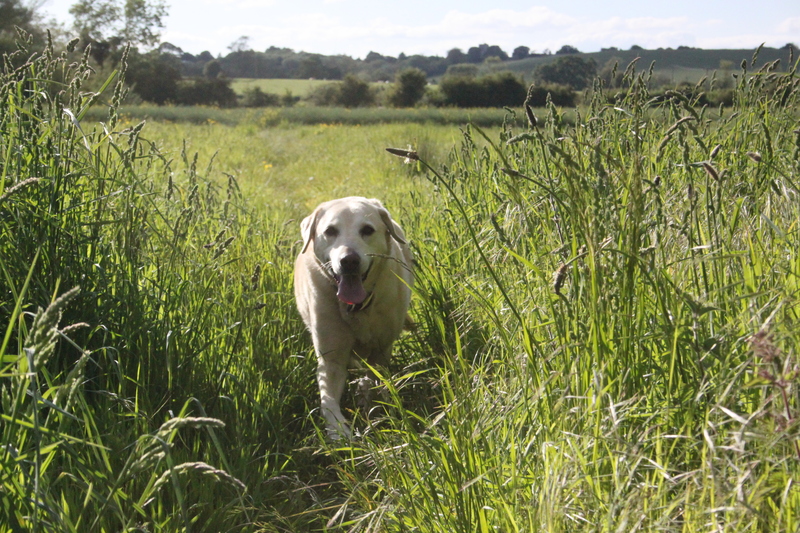 Last week we were really disappointed to see a local farmer had sprayed the footpath around a field of wheat, which had not been sprayed before.